The Macy’s Fireworks Spectacular will light up the New York City’s sky for the Independence Day celebration once again this year. Broadcast live on 1010 WINS, the official radio station of Macy’s 4th of July Fireworks Spectacular, the show promises more than 20 minutes and roughly 70,000 pounds of explosions. Taking place over the Hudson River, the fireworks show begins at 9:20 p.m. and brings out about 2 million spectators every year. 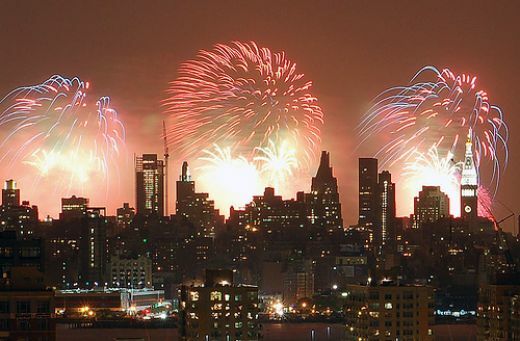 Make this year one to remember at one of the best places to watch fireworks in New York. Board any number of the city’s beautiful cruise boats for a full night of drinks, dancing and perfect fireworks viewing. The Circle Line offers the cheapest option to cruise the Hudson during the city’s biggest fireworks show. A live DJ will bring the party onto the dance floor, and food and drinks will be available for purchase on board. Pick up tickets online before they sell out; this is one of the most popular ways to see the display. Hours: 7:30 p.m. to 11 p.m. If you want to really party in style, board a 19th-century schooner — aptly named America 2.0 — and make a classy night of it with close friends and family. This is one of the more expensive cruises offered for Independence Day but if you’re looking to impress a date, it’s the activity for you. Hors d’oeuvres will be served alongside an open bar with champagne and other drinks. Be right on the water when fireworks are launched from six barges along the Hudson. Hours: 8 p.m. to 10:30 p.m.
One of the most iconic images in the entire country, the Empire State Building can’t be beat for a patriotic fireworks viewing. You’ll need to plan ahead for this event because tickets are limited to only about 300 for the night. If you haven’t yet made it to the 86th floor of this historic building, now is your chance to see the Manhattan skyline lit up in celebration. Tickets will include admission to the observatory as well as light refreshments. Hours: 7 p.m. to 10 p.m.
Every year, this museum opens its doors to ticketholders for a perfect viewing party of the Macy’s fireworks display. This World War II aircraft carrier turned museum promises a pretty patriotic Independence day as well. A ticket to the event will include entrance to the museum, a live DJ and a simulcast of the fireworks musical score. Special VIP vieweing of the spectacular event from the museum’s flight deck is the main attraction of the night. Hours: 6:30 p.m. to 10:30 p.m.
Another rooftop bar in NYC that offers great views of the Manhattan skyline is the Press Lounge, located at the top of the Ink48 Hotel downtown. Known as one of the hottest bars in the city, this lounge features comfortable seating, a glass-walled interior space and modern architectural touches such as a low pool lit by footlights at night. The July 4th celebration includes an open bar with signature cocktails and a buffet featuring organic foods from the hotel’s own restaurant, Print. The fireworks show will be most visible from the West Side, from 22nd to 55th Street. The roadway can offer ideal viewing, as long as you’re willing to stand. Get there early to claim your spot. The northbound lanes of West Side Highway will be closed to traffic to allow visitors to watch the show from there. The highway opens to pedestrians at 4 p.m. 12th Avenue will also be open at the same time for more standing spots.